hypothesis best suited to open the way to the next better one"
Animal behavior develops as a result of the interaction between genetic and environmental influences. Some behaviors have more genetic (innate) determinants than learned ones; in others behaviors, the opposite is true. Innate is a Latin word which means "born with". In one side, there are the so-called instinctive behaviors, which are genetically programmed and usually are very littly influenced by experience or learning. They are part of a constellation of skills which are essential for life and survival. The sucking behavior of babies is one of several instinctive behaviors which we are born with. In the other side we have behaviors which are almost entirely dependent on learning, such as lacing your shoes. There is, however a whole spectrum of different mixtures of innate and learned. For example, many learned behavioral patterns are dependent on innate mechanisms. A kitten has the brain mechanisms for hunting rats, but it must learn how to use them with its mother cat. The same happens with some song birds: they must hear their colleagues singing otherwise their singing patterns will come out garbled and irrecognizable for the birds of the same species. An amazing and very curious example of genetic and environmental influences on animal behavior is provided by imprinting. It is a phenomenon exhibited by several species when young, mainly birds, such as ducklings and chicks. 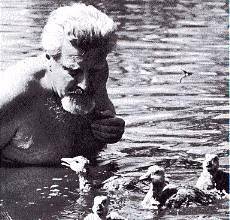 Upon coming out of their eggs, they will follow and become attached (socially bonded) to the first moving object they encounter (which usually, but not necessarily, is the mother duck or hen).The first scientific studies of this phenomenon were carried out by Austrian naturalist Konrad Lorenz (1903 - 1989), one of the founders of ethology (the study of animal behavior). He discovered that if greylag geese were reared by him from hatching, they would treat him like a parental bird. 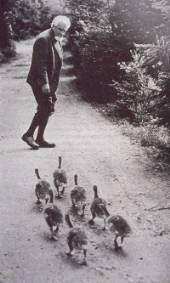 The goslings followed Lorenz about and when they were adults they courted him in preference to other greylag geese. He first called the phenomenon "stamping in" in German, which has been translated to English as imprinting. The reason for the name is because Lorenz thought that the sensory object met by the newborn bird is somehow stamped immediately and irreversibly onto its nervous system. In other experiments, he demonstrated that ducklings could be imprinted not only to human beings, but also to inanimate objects such as a white ball. He discovered also that there is a very restricted "window" of time after hatching that will prove effective for imprinting taking place. For this and other works, Lorenz was awarded the Nobel Prize for Medicine and Physiology in 1973. Lorenz's work provided startling evidence that there are critical periods in life where a definite type of stimulus is necessary for normal development. Since repeated exposure to an environmental stimulus (association) is necessary, we could consider that imprinting is a kind of learning, albeit with a very strong innate element. Some of the characteristics of imprinting could be explained by the tendency that the baby bird has to search for and responding selectively to particular stimulus patterns, such as the profile of an adult bird. Before imprinting takes place, the brain of the young bird has a capacity to recognize the types of stimuli which will subsequently be associatively learned, and this is one of the innate components of imprinting . The brain also commands a number of wired-in motor actions that facilitate the learning process and maintain proximity to the object of its attachment. This is another innate, or species-specific, component. 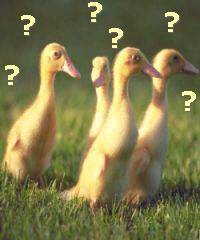 Learning, therefore, takes place in a genetically determined substrate and at a biologically optimum time in the duckling's life cycle. The whole phenomenon has appeared undoubtedly as a result of natural selection, with the function of providing recognition of kin, for purposes of social attachment and reproduction. Its instinctive characteristics are clear by the fact that once it is imprinted upon the baby animal, it remais for life, even if it is totally unnatural (a red ballon or a cardbox as its mother!). 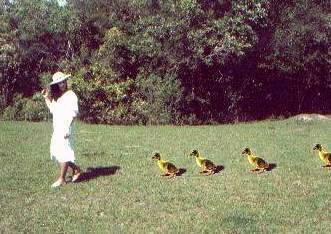 The researcher imitates a mother duck's quacking in front of a group of ducklings just after they had hatched. They learn very rapidly to identify their mother on the basis of visual, olfactory and auditory cues. Click here to see the enlarged ducklings. 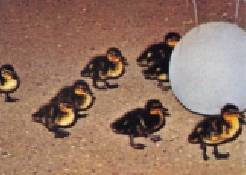 Thus, the ducklings perceived the researcher as their mother and followed her accordingly. In the natural environment, behavioral imprinting acts as an instinct for survival in newborns. The offspring must immediately recognize its parent, because threatening events, such as the attack by a predator or by other adults could occur just after hatching. Thus, imprinting is very reliable to induce the formation of a strong social bond between offspring and parent, even if it is the wrong one. This is only one of the many forms of imprinting which have been studied, and its called filial imprinting. Another form is sexual imprinting, in which birds learn the characteristics of their siblings, which later on will influence their mating preferences as adults. In greylag geese, filial and sexual imprinting occur almost simultaneously, but in other animals there is a clear interval between the two processes. Imprinting in mammals is more rare. Primates are altricial animals, that is, they are born in a very "incomplete" state, with an exceedingly immature brain that will take many months to become fully operational, alert and active with all its senses and actions. Therefore the mother is the supreme caretaker and protector, and mother-child bonding takes place via other processes than imprinting. There is no hurry, so to say. Other early pioneers of ethology, such as Niko Tinbergen (who got the Nobel prize in the same year as Lorenz), studied another important phenomenon in animal behavior, which he called Fixed Action Patterns, or FAPs. This is a behavioral sequence of more elementary motor acts, which forms a pattern with a clear function in the animal's life. 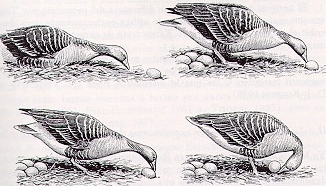 The egg-retrieving FAP in geese For example, when an egg rolls out of a duck's nest, the mother duck retrieves it by an elaborate sequence of movements of its head and bill. It is however, rather stereotyped, because if the eggs escapes the bill, the duck continues to execute the movement in the void, until it reaches the nest, only then to start again. Therefore, by discovering imprinting, Lorenz actually demonstrated how experience might direct a fixed action pattern. He believed that imprinting is the result of the interaction between instinct and learning. During his time there was a raging debate between the importance of the two factors in animal behavior. This was called the "nature versus nurture" debate. Lorenz provided evidence that this was actually a false dilemma: in almost all animal behaviors there is a mixture of both. However, Lorenz thought that imprinting differs from associative learning in several ways. Firstly, because there is a stringent critical period, or fixed time, for it taking place. With few exceptions, this is not so with true associative learning. Secondly, because imprinting appears to be irreversible, and, again, associative learning is highly volatile, usually fading with time (the "forgetting" process). Thirdly, because Lorenz proposed that imprinting is not an individual memory process, which is restricted only to the animal who experiences learning, but that, rather it is a kind of "supraindividual" (beyond and above the individual) conditioning of a group of organisms. In other words, it is species-specific, and not a general process such as associative learning. Recent studies have shown that the traditional view of imprinting held by Lorenz and his followers might be incomplete or even incorrect. Lorenz studied animals mostly in their natural environments, since this is one of the main tenets of ethology. However, modern researchers have been examining imprinting in the more rigorously controllable context of the laboratory. The objective of this approach is to study the role of special forms of learning, such as visual recognition memory, that operate in imprinting. 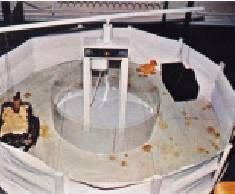 In the laboratory, rearing and testing situations for all subjects are more easily set and controlled, such as the environment where eggs are placed before hatching happens. For example, temperature and lighting are constant, the walls and floors of all apparatuses are black, no food or water is made available during the experiment, and handling of the animals is kept to a minimum. These investigations have shown that imprinting is neither rapid nor irreversible, and also not restricted to a critical period, as was claimed by Lorenz and his followers. It has been also discovered that imprinting occurs in other species, and that learning components are more important than previously thought (Hoffman, 1996). There is evidence that this cumulative process entails the release of endorphins in the brain. Apparatus used in the laboratory to study imprinting in ducklings. Therefore, it has been hypothesized by some authors that the imprinting stimuli provide a comforting feedback by the release of endorphins, thus fixing the association. Another important re-examination of Lorenzian theories is that the critical period might result from the freedom of interference by the onset of the fear of novelty, which occurs at about the third day after hatching. Thus, there is no competition with fear responses and the environmental stimulus becomes a target for social bonding. Anatomical diagrams showing the dorsal ventral ridge and hyperstriatum structures, which are associated with imprinting Are there particular sites in the brain which are responsible for imprinting? It seems so. Several studies using different neurobiological techniques have implicated the intermediate and medial part of the hyperstriatum ventrale (IMHV) on both sides of the brain, as being one of the probable structures for the storage of the imprinted association (Horn, 1985). The dorsal ventricular ridge (DVR) is a unique brain structure present in birds and reptiles. In birds, the DVR includes the hyperstriatum ventrale, plus an area called the wulst. The wulst seems to be part of a system which resembles the mammalian memory substrate. Decisive experimental evidence on the role of the IMHV was obtained by Horn and his collaborators in a series of papers. He showed that chicks that had their IMHV surgically removed on both sides could no longer retain imprinting and could not recognize the imprinting stimuli. They will maintain, however, learning which is externally rewarded upon presentation of the stimulus, although they remain unable to learn its characteristics. In conclusion, imprinting is a wonderful example of the interaction of innate, species-specific behavior, and the properties of a special kind of learning, which has been called "perceptual learning" (Bateson, 1966). These studies maintained that animal species are genetically constructed to enable them to learn specific types of behavior that are important for the survival of their species. Imprinting is one of these forms of behavior. As an afterword, we must mention that breeders of ducks and geese are very much aware of the existence of imprinting, and sometimes take advantage of it. Sadly, the intensive practices of economic exploitation of poultry have led to the process of artificial egg incubation in sterile and non-natural environments. This, in consequence, produces millions of "orphan" chicks, goslings and ducklings, which are deprived of their natural behavioral development. Grier, J., Counter, S. & Shearer, W. (1967). Prenatal auditory imprinting on chickens. Science, 155, 1962. Guiton, P. (1959). 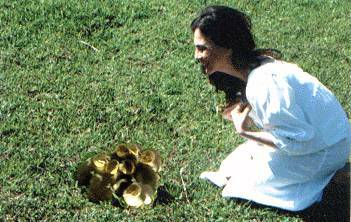 Socialization and imprinting in brown leghorn chicks. Journal of Animal Behavior, 7, 26. Howard S. Hoffman (1996) Amorous Turkeys and Addicted Ducklings - The Science of Social Bonding and Imprinting. 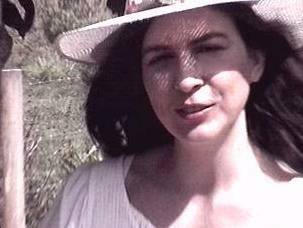 Horn G (1985) Memory, Imprinting, and the Brain. Oxford:Clarendon Press. Jaynes, J. (1957). Imprinting: The interaction of learned and innate behavior.The critical periods. J. of Comparative and Physiological Psychology,50, 6. John A. Wiens, "Lorenz, Konrad Zacharias," Discovery Channel School, original content provided by World Book Online, Lorenz, K. (1952). "King Solomon's ring." New York: Crowell. Dorling Kindersley. (1997) . Austrian Zoologist Shows How Young Birds Identify Their Parents. What must be known in order to understand imprinting?